The standard time for honoring children’s attention span when you are teaching has been 1 minute for every year with a max of 5 minutes. An example would be when you are teaching 3-year-olds. You would have 3 minutes to talk before you needed to switch and do something else to keep their attention. But in a day of 140 characters, it may be time to reconsider. Here’s an example. 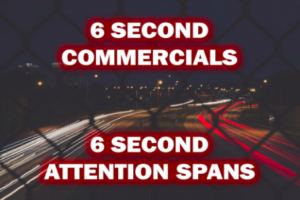 Up to this point, the minimum industry standard for a broadcast TV commercial length has been 15 seconds. 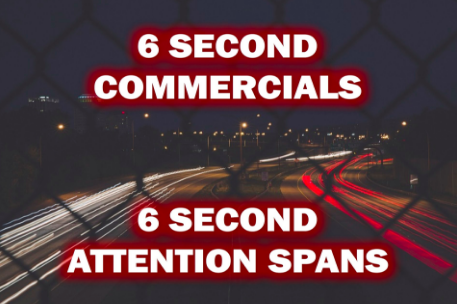 But now the 6 secondcommercial is being introduced. Fox Network said it will launch the first 6 second ads on broadcast TV during its coverage of the Teen Choice Awards this Sunday, August 13. This adjustment confirms again that kids’ (and adults’) attention spans continue to shrink. It means just putting a talking head in front of kids is becoming less and less effective. Doing so will cause them to check out in just a few minutes…or now it looks like even sooner. Trying to “download” information by droning on and on will actually cause kids to retain less. You only remember 10% of what you hear, especially if someone is not honoring your attention span. Oh, you may be able to force them to “sit still” with threats or promises of rewards, but they will check out internally and will probably thinking about something else or watching the clock, wanting it to be over. It means if you want to capture the attention of today’s kids, then you’ve got to make your lessons interactive and hands-on with short segments. If you want to invest in kids effectively, then you’ve got to involve kids in the lesson. The more kids talk…the more kids learn. Let this be your guide – THE SHORTER THE BETTER. Don’t worry…today’s kids can consume and process the information you send in short bursts. It’s the world they live in and how they are wired.